Photo: Girls rescued from human trafficking, now safe at our rehabilitation home receiving training in embroidery and other skills as part of their path toward recovery and empowerment. We are thankful to share that last week, two 16-year-old girls were rescued from the dangers of human trafficking. The trafficker took the girls from their village in the Nuwakot district and kept them in a lodge in Kathmandu, where they were forced into prostitution against their will. After 15 days of imprisonment, the police raided the lodge and rescued them. 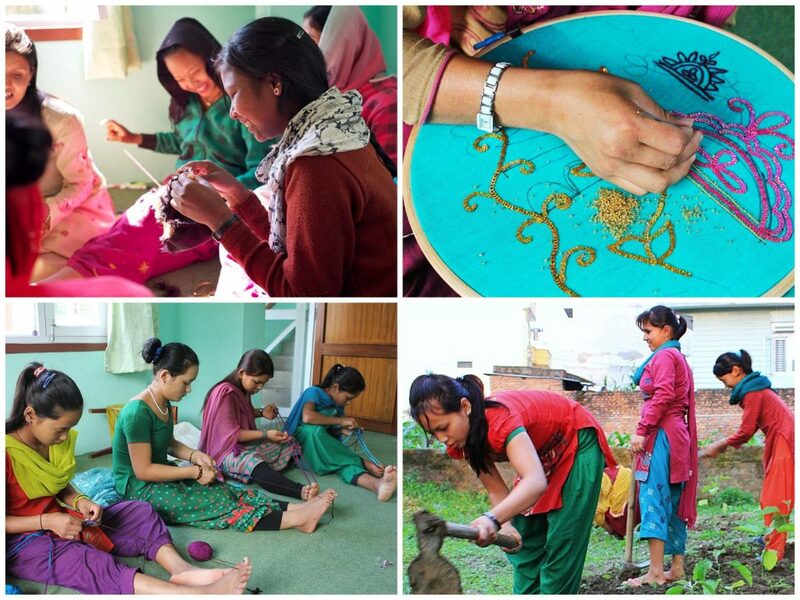 Now the girls are safe at our rehabilitation home in Kathmandu where they receive counseling and medical care, room & board, literacy classes, and become proficient in several craft-making, seamstress, and gardening skills (see photo below) through daily coursework offered by our full-time teachers. These useful skills will enable the girls’ journey toward recovery, empowerment, and continued freedom. For others, it’s not so fortunate. An estimated 12,000 Nepalese women, mostly teenagers or younger, are being trafficked across the Nepal-India border each year, where the majority end up in brothels as prostitutes against their will. Others end up in different kinds of slavery where they’re trafficked to other countries and are usually abused and neglected as domestic slaves. Often times relatives are lured with an attractive “advance” and tricked into thinking the girl will be working in a domestic servant or nanny role, or some similar alleged job. In almost all cases, the targeted children are from among the poorest, such as those of the slums or very poor villagers, where parents or relatives of orphans are most susceptible to believe the schemes of the traffickers. In order to supplement funding for our Nepal programs, we’ve equipped our native team with a farmland enterprise, and made the girls’ crafts available for sale online, at the She Has Hope crafts shop. Our farmland is not only providing profits for funding, but also nutritious ingredients for our program participants’ meals.